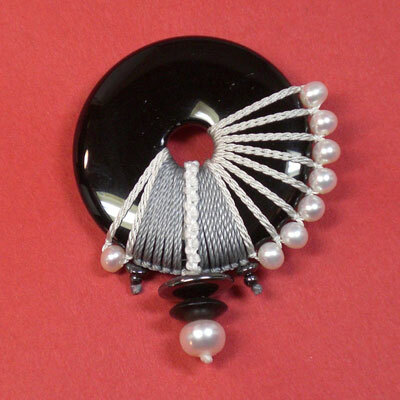 This series of pins are designed to be worn on a jacket lapel or a sweater on the left side so that the beads frame the outside rim away from the face, bringing the eye back to the face. Or wear it as a necklace with a sterling silver brooch converter. This particular pin works well with a 4mm rubber cord or a sterling silver chain. Circle donut is 40 mm in diameter. Assorted Beads.